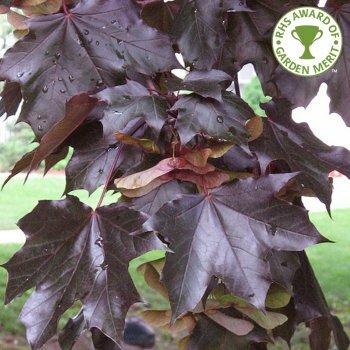 This large, robust and vigorous ornamental tree has deep crimson/purple foliage throughout the spring and summer, hence the common name Purple Norway Maple. The autumn colour foliage ranges from orange to brown making this a spectacular maple tree throughout most of the year. Flowers are small, yellow and tinted red in spring. It will do well in most soils and is tolerant of many difficult conditions including exposed, coastal positions. Ideal for screening in larger gardens with an attractive rounded head in habit. Expect a height and spread of 8 x 5 metres in 20 years but more in maturity. When planting Norway Maple trees, such as the Purple Norway maple, it is important to prepare the planting area well. Pot grown Norway maple trees can be planted at any time of the year. Bare root acer platanoides trees need to be planted between November and March. If you are not planting your bare root Norway maple tree straight away, it is best to ‘heel in’ your tree. Dig a hole in an unused area of soil and pop the roots of the tree in, gently firming around. If you’re planting within a couple of days, you can untie the bag around the roots, water, re-tie and then store in a frost free garage or shed. Whether planting a pot grown or bare root Norway maple tree, you will need to carry out the following to prepare your planting site. Firstly, remove all weeds and grass within a metre of your desired planting hole then dig a hole as deep as your root mass and approximately 2x as wide. We recommend digging a square hole as this encourages the roots to grow straight as opposed to around inside the hole. To help your tree establish more effectively, we advise applying root grow (sprinkle in the hole for pot grown trees or prepare and apply the gel mixture for bare root trees), especially if you have poor soil. You do not need to amend the soil with compost when planting a Norway maple tree, simply fill in the hole and firm around gently. Make sure not to bank the soil up around the collar of the tree as this can cause problems. When planting Norway maple trees, you should use ericaceous compost when possible as this encourages vibrant foliage colour. To see how to use a tree stake and tie, watch our informational how to videos. If you’re planting in dry weather, water well and regularly for the first few months. The same goes for spring and summer planting. Make sure to keep an eye on your young tree and increase watering if there are extended periods of hot or dry weather. If you’re planting in autumn, you may only need to water your tree a little. If possible, use rain water instead of tap water as this is more acidic and better for foliage colour. We also stock a range of irrigation kits, suitable for a variety of planting schemes. Once planted, it is important to keep the area free of competing weeds for the first couple of growing seasons. Using a glyphosate based weed killer or installing mulch matting and bark chips will aid in this. Only shade loving plants will grow beneath Norway maple trees. If you wish to cover the area, decorative bark is the best option. If you know your area is prone to rabbits, we would advise using a rabbit guard. Pruning should be carried out in the dormant season, from November to March. Norway Maple trees bleed during other times of the year so pruning can weaken the tree. However, Norway Maple trees very rarely need pruning. The natural shape is normally the most attractive and pruning should be carried out with a less is more approach. Only remove, crossing, damaged or diseased branches.